Home / Engineering Lifecycle Management, SimManager, Systems & Controls / Should I Invest in Simulation Process Data Management (SPDM)? 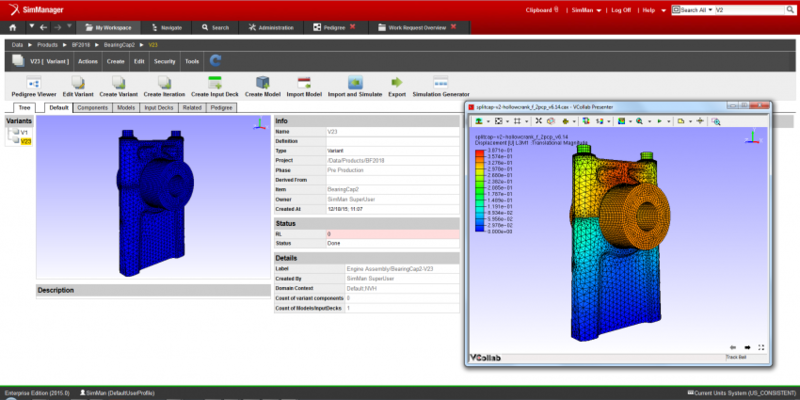 Today, simulation process and data management systems (SPDM) are being used by many manufacturing companies. SPDM significantly contributes to their efforts to maintain competitive advantage in the market. With SPDM, companies are able to increase productivity, improve their quality with fewer errors and gain a greater insight into the engineering cycle. SPDM stores all the data which flows during the simulation process and makes it traceable, thus, any type of “what if” studies can be applied at anytime. Moreover, since SPDM is consolidating the compute capacity and licenses to a single location, information technology management reported a significant cost saving in IT investment. Remote users make up to 25% – 30% of the SPDM implementation. BMW reported realization of savings up to 15% on preprocessing, 80% in post processing and 60% savings in human effort. Audi, another user of SPDM, reported a “weeks to days” reduction in the time to deliver a new design to a customer with the help of SPDM. As a conclusion, SPDM, when integrated with simulations such as multibody dynamics, provides significant value to the manufacturers. It increases the efficiency, reduces production time and number of errors, and provides certainty of the data. With this implementation, engineers can create much more effective engineering workflow in design and also in production stages.